NEW IN: winter essentials & pretty things. Last night, while I was trying to put together my weekly Sunday Cravings, I realized that there isn’t really anything I am currently lusting over. Except a Fendi peekaboo bag, but that’s a different story… So instead of telling you guys about the items on my wishlist, I decided to share some of my newest purchases (and gifts) that are currently rocking my world. The list includes some amazing Winter essentials and some other pretty things that are currently putting a smile on my face. Hallhuber wool scarf: At the press days back in October, Hallhuber surprised their guest with a monogrammed scarf. Not only do I love the personal touch, but it is also a gift that has been in use almost daily since then. The scarf is so cozy and a great alternative to the pricey Acne wool scarves. Sandro-Paris lace blouse: For my sister’s birthday I flew up to Berlin and we spent the day shopping. I wasn’t really expecting to find anything, but just as I was heading out of the store, I spotted this lace blouse (as seen here). I am currently loving it layered with a cozy knit, but I know it will also be perfect for Spring and Summer! 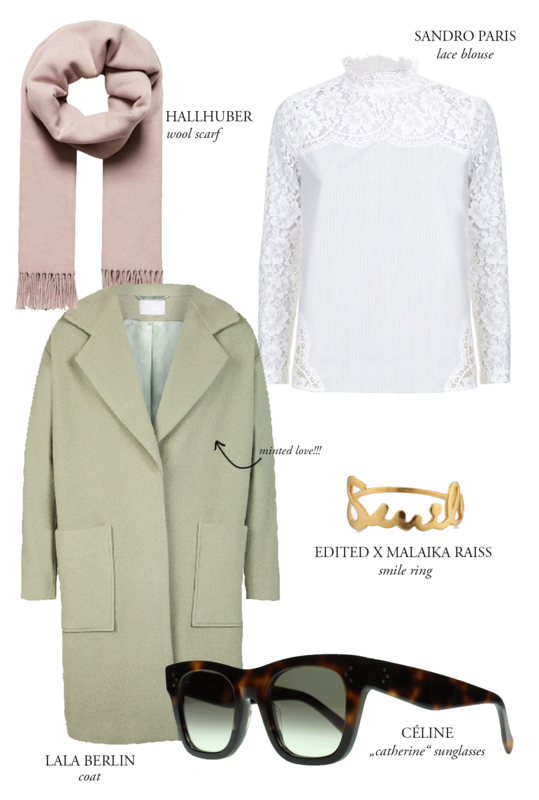 EDITED x Malaika Raiss “smile” ring: The perfect daily reminder to put a smile on your face! Delicate but a statement piece at the same time – just how I love my rings! Oh, and not to mention the other super cute pieces from the new collection. Céline sunglasses: On a recent trip to Munich, Kathi and I sort of tripped into the Céline boutique at Oberpollinger. We had an hour to spare between meetings and while she went home with her dream bag, I finally splurged on my first pair of Céline sunnies. Der Mantel mit seiner mintfarbe ist mal was ganz anderes und irgendwie besonders. Love it. Ich finde die Farbe des Mantels super schön! Ist mal was anderes und ich glaube der steht dir wirklich sehr gut! Und die Bluse ist auch einfach ein Traum! Oh so schöne sachen <3 Muss unbedingt wieder mal shoppen gehen. Tolle Sachen, gefällt mir alles auch sehr gut. Ich habe gerade meinen ersten Acne Schal im sale ergattert und bin auch ganz stolz. Klasse Idee mal das zu posten, was man tatsächlich gekauft oder anderweitig bekommen hat. Der Schal gefällt mir total gut! Ich habe mir vor 2 Jahren einen ähnlichen Schal gekauft, den ich immer noch jede Woche mindestens 1x trage. Die Bluse ist einfach nur ein Traum!